Break the permission inheritance of a SharePoint list item and grant permission only to a specific user and group. $Item.BreakRoleInheritance($True) #Breaks permission inheritance, if its not already! 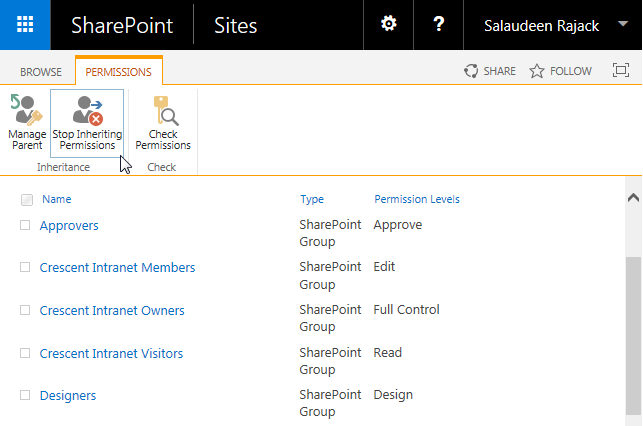 In an another requirement, we had to Set Item Level permission to a SharePoint Group to all documents in a specific document library with 100+ documents. Earlier, I wrote C# code to set Item level permission on Event Receiver to Set Item Level Permissions . This time let me do it with PowerShell for SharePoint 2007. AddItemLevelPermissionToGroup "http://sharepoint.crescent.com/sites/sales" "Documents" "Approvers" "Read"
How to Break List Permissions and grant access to a user using PowerShell? Similarly, We can add users at List permissions. foreach($item in $list.items | Where $Item["aktiv"] -eq "Ja") .... Field AKtiv= Checkbox Ja/Nein. BUT: the filter doesnt work. why? Does anybody why? what is wrong in my filter Action? Great script!!! Thanks a lot! How to Add Custom File Type Icons in SharePoint?